FATEHGARH SAHIB—The district police of Sri Fatehgarh Sahib arrested an Amritdhari Sikh student on March 8 during the inaugural ceremony of the annual “Khalsa Sports” tournament. The arrest took place in relation to a dispute over the leading the opening ceremony of the 12th annual Khalsa Sports being held from March 8 to 10th. 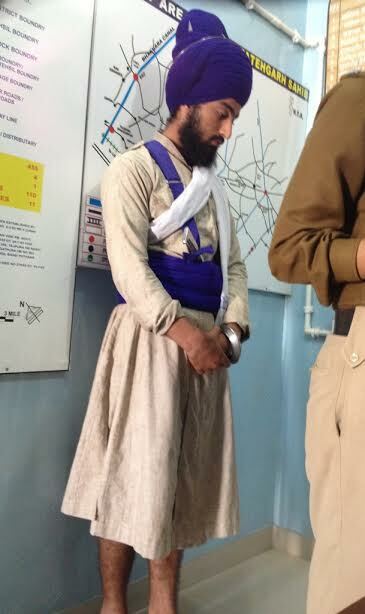 Gurpiar Singh, the arrested youth is a student of Baba Banda Singh Bahadur Engineering College, Sri Fatehgarh Sahib. The dispute took place when the University staff had placed apostate (non-amritdhari) students in the front line of procession march being carried out to inaugurate the tournament. While the tournament takes place under the banner of “Khalsa Sports”, the University staff this year sidelined the amritdhari youth by instead having students without dastars lead the ceremonies. Gurpiar Singh, who is pursuing B. Tech at the Baba Banda Singh Bahadur College of Engineering and Technology, had opposed the move of placing non-amritdhari students in front line of procession. Gurpiar Singh was indicted under sections 107/151 of Cr.P.C (Code of Criminal Procedure) but later released the same night. Talking with Sikh24’s correspondent, Prof. Mohinderpal Singh, General Secretary of Shiromani Akali Dal (Amritsar) condemned the incident. “Nothing could be worse than organizers of Khalsa Sports lodging complaints against their own amritdhari students,” he told Sikh24. Gurpiar Singh was in the limelight during the “Lakhnaur Sahib” morcha when Bhai Gurbaksh Singh commenced his second hunger protest. He also went on a brief period of hunger strike at the Jantar Mantar after the police detained Bhai Gurbaksh Singh. Pics & Videos – Sikh Sangat Protesting in Large Numbers at Kotkupura against the Beadbi of Sri Guru Granth Sahib Ji. High Court Defers Bhai Papalpreet Singh Bail Hearing Again | Next hearing of the case to March 14.